Delays are followed by user selectable modulated filters. 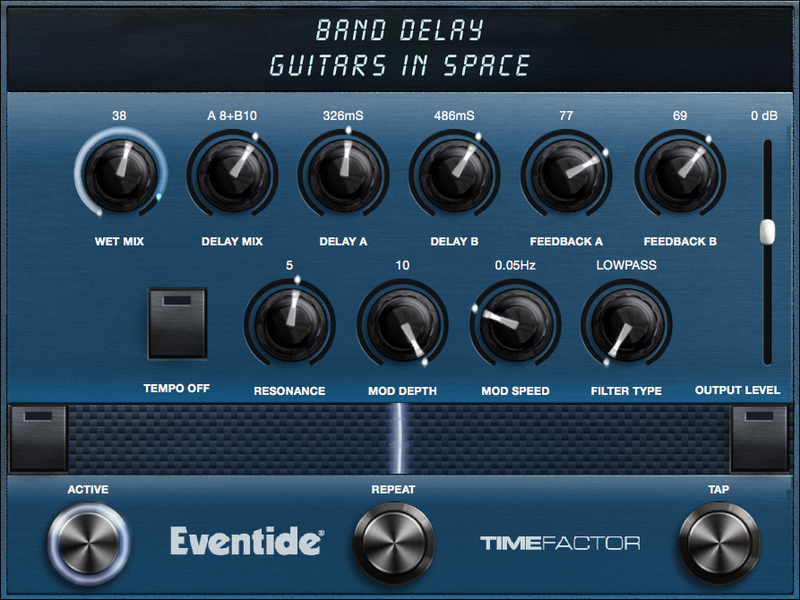 Controls the relative level of the twin delays, Delay A and Delay B. The H9 has circuitry that detects which input/output jacks are being used and adjusts the routing of signals through the Effects algorithm accordingly. Dly Mix’s mixing behavior depends on whether you’re using mono or stereo outputs. For Mono Out, with [DLYMIX] = 0, output 1 will have only Delay A’s contribution. With [DLYMIX] = 50%, Output 1 has an equal amount of Delay A and Delay B. With [DLYMIX] =100, Output 1 will have only Delay B’s contribution. For Stereo output, with [DLYMIX] = 0, BOTH outputs will have only Delay A’s contribution. With [DLYMIX] = 50, Delay A goes to Output 1 only and Delay B goes to Output 2 only. With [DLYMIX] = 100%, BOTH outputs will have only Delay B’s contribution. Sets delay time for Delay A output B from 0 to 3000 ms (milliseconds). With Tempo OFF, delay is displayed in mSec. With Tempo ON, delay can be sync’d to the tempo and is displayed as a rhythmic sub-division of the tempo beat value - changing this from 0 to a whole note in common note increments. Controls level of Feedback A, the number of repeats. Sets the resonance or sharpness of the filter. Varies from 0 (subtle effects) to 10 (dramatic resonance effects). Sets the amount that the filter cut-off or center frequencies are modulated/shifted. Sets the modulation rate for the filter center frequencies (0-5Hz). Select filter type – Low Pass, Band Pass or Hi Pass. Press and hold for infinite repeat.